The ProMic Laser is a solid performer for the price and could give the Rode VideoMic a run for its money. Sturdy yet lightweight build. Good value for money. No furry windshield accessory at present. With the ProMic Laser, sE Electronics has taken the not so big leap into camera microphones. "The ProMic Laser is sturdy, but remains lightweight courtesy of the aluminium construction"
With the huge growth in DSLR filmmaking, it's no wonder the company have decided to take the plunge. The ProMic Laser is a powered, directional shotgun mic with a hot-shoe mounted shock-mount. As the unit is powered, sE has included a -10dB pad which will help you curtail any unwanted noise during recording. 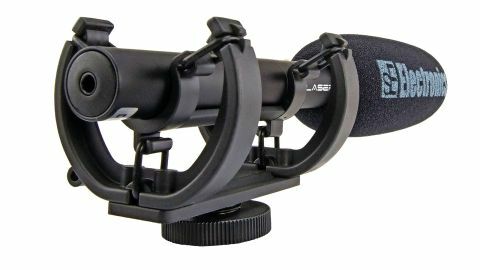 The build quality is up to sE's usual high standard and the unit feels more sturdy than its nearest rival, the Rode VideoMic, and yet still remains lightweight courtesy of the aluminium construction. You would hardly notice it attached to your camera. One thing we would like to see is a nice big furry windshield accessory released in the near future, which would certainly help against stronger winds for location work.